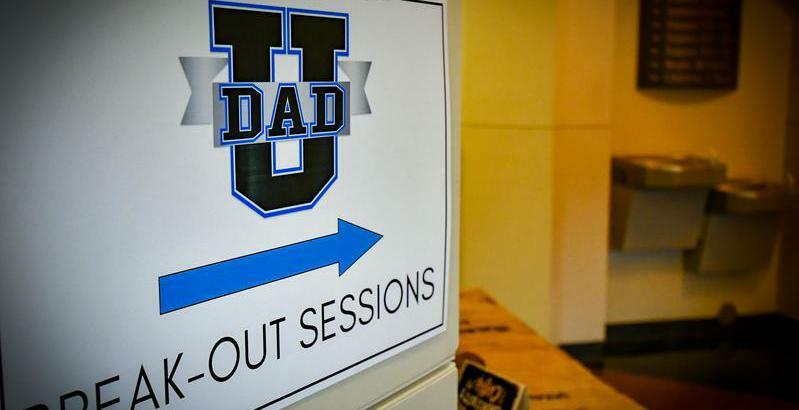 Suit Up Ministries - DADS...Watch OUT...God is seeking You! DADS...Watch OUT...God is seeking You! DADs...When I was in college, one summer I visited my friend that was attending summer classes at Baylor. He was living in a temporary dorm room for this brief summer session. Back then, the bathrooms were down the hall. So, in the morning and at night if you showered, you had to carry all your stuff to the showers, toiletries, towels etc. The dorm was full of junior high summer campers from all over Texas for a middle school aged retreat. So needless to say I had to “time” my evening shower appointment strategically. The second night there, when I turned out my light and laid in bed, I suddenly sat up reaching for my other hand and realized I was missing my ring…a National Championship ring I had just received for football that spring for the season before. You see I had this bad habit of taking my rings off and putting them on the sink when I washed my hands. So in the dark…immediately I ran down the hallway to the bathrooms to seek my lost ring. Gone. It was late. No one to call. Embarrassed. Told my friend. We searched every stall every shower. Gone. Reported the next day. Checked lost and found several times the next few days…eventually the realization that I had to go home. I got in my car to go home. Ringless. 15 Now the tax collectors and sinners were all gathering around to hear Jesus. *Interesting that tax collectors would gather around to hear Jesus! In Roman times the tax collectors were loathed. Reviled. They were like “varsity” sinners. Compared to the “regular” or JV sinners! *Think about this…tax collectors and Pharisees both legalistic on opposite ends…both in their roles doing their jobs without compassion! *What a great opportunity Jesus had before him! Before this time…Jesus had gone to them…but because of His ministry they have “gathered” themselves to hear Him. Then the greatest story teller ever took full advantage of this opportunity. 3 Then Jesus told them this parable: 4 “Suppose one of you has a hundred sheep and loses one of them. Doesn’t he leave the ninety-nine in the open country and go after the lost sheep until he finds it? *The Pharisees struggled with this idea because they did not see God as this caring God but a more authoritarian God with rules. More like a King vs a savior. They cannot comprehend this idea of “inviting” others in! 5And when he finds it, he joyfully puts it on his shoulders 6 and goes home. *And it gets even better! *Earlier I mentioned about my lost ring. Think about the most precious possession you have lost. Thought it was lost forever! Even finally reach the point of realization that its gone and most likely never to be found. You want to tell everyone!! A party! You are relieved. You are grateful. You are happy. You want to celebrate. And it’s just a thing! With God, we are more than a thing. We are His precious children. He yearns for us. When we go to the depths of despair and it seems hopeless he cries with us. When we experience a miracle of new life in a new granddaughter…He rejoices with us. We are not just a thing. We have been adopted into His Family. 7I tell you that in the same way there will be more rejoicing in heaven over one sinner who repents than over ninety-nine righteous persons who do not need to repent. *God wants an active relationship with you. How valuable we are to God! He cares about each and every person on this earth. When we are lost, He pursues us. When we wander, He pursues us. When we run, He pursues us. And He and all the angels rejoice when even one person comes to Christ. I am daily the wandering sheep. I am like the lost coin that falls on the floor and rolls under the bed into darkness. I am like the one in the story later in Luke of the Prodigal son, that goes away from his father. But like the shepherd with the one lost sheep, and the woman with the one lost coin or a father with the one lost son, God never gives up His seeking for us. 38 For I am convinced that neither death nor life, neither angels nor demons,[a]neither the present nor the future, nor any powers, 39 neither height nor depth, nor anything else in all creation, will be able to separate us from the love of God that is in Christ Jesus our Lord. DADs...Ultimately, God is going to meet you where you are. God’s grace covers all. We fight not for the victory, but from the victory. Thanks, be to God, who runs to us with open arms, and is always ready to greet us with His kiss and pick us up over His shoulder and carry us home. DADs…its SIMPLE…just surrender to Christ that is constantly SEEKING you, allowing you to be the DADGod has called you to be! !